I don’t think anyone chooses to be homeless by choice. Still, people who live on the street are almost always looked upon with disgust. One day, Casey Fischer saw a homeless man singing for change on the street. After a while, he went to Dunkin’ Donuts, where Casey was sitting. He had only managed to scrape together a dollar. Casey offered the man a coffee and a bagel, and although the man wasn’t particularly pleasant, he took her up on the offer. Then Casey asked the man if he wanted to sit down at her table. The man, whose name is Chris, looked shocked, but at last, he joined her at her table. He told Casey that people were usually look down on him because he’s homeless. He also acknowledged that it was drugs that made him homeless and hated himself for it. Chris still dreamed of becoming the son his mother could’ve been proud of, even though she died of cancer a long time ago. Casey and Chris talked for over an hour before Casey realized that she had to go back to school. Time flew and her class was about to start. Just when Casey got up, Chris asked her to wait a few seconds while he wrote something down on a wrinkled little piece of paper. 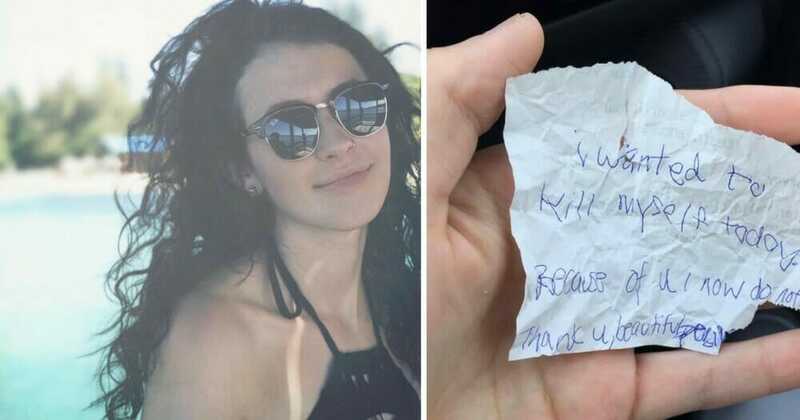 He pushed the note in her hand and apologized for his ugly handwriting. Then the two of them said goodbye. When Casey unfolded the paper, she realized she had done something much more important than feeding a homeless man. Sometimes, a thoughtful gesture, some kind words, or just a smile can make more of a difference than you can imagine. Remember the next time you meet a person who isn’t feeling as good as you. You have no idea what they have going on in their life. But one thing is certain, everybody is equally worthy of us. Not everyone can proudly say that they’ve saved the life of their fellow human, but Casey really can! Share this article with your friends on Facebook if you also think we should care more about our fellow people!